FAITH AS UNKNOWING: We are often tempted not to trust in God but to trust in our faith tradition of trusting in God. They are not the same thing! Talking (and preaching) about Christians and theologians who trusted in God is a clever way to (personally) avoid the experience itself, to avoid encounter with the living God, to avoid the ongoing Incarnation. We tend to trust the past for its own sake, as if past time is somehow holier then the present, the ‘right now’! God did not come to earth to protect human traditions. In fact, Jesus pointedly asks the Pharisees and scribes,’And why do you, by your traditions, violate the direct commandments of God’ (Matt. 15:3, NLT). Authentic and mature ‘Tradition’ calls us to surrender to the wonderful and always too-much mystery of God. This is the ‘apophatic’ tradition, or the ‘cloud of unknowing’. It is the very concept of faith – the freedom not to know because I experience myself as being known, more fully than I can know or even need to know. ‘All that I know now is partial and incomplete, but then I will know everything completely, just as God knows me completely’ (1 Corinthians 13:12, NLT). In silent prayer, let go of the need to use words to approach God. Let go of all ideas about God, self, and reality. Even if you don’t sense God’s presence, trust that you are fully seen and known by the One who is merciful, gracious, faithful, and steadfast in love. Richard Rohr ‘Gateway to Silence – Awaken me to Love this day.’ Jan. 22nd. Thomas joins the ranks of those who recognize divinity in Jesus: Simon Peter (Matt 16:13ff), Martha (John 11:27), and the Roman centurion (Matt 27:54); yet he is most frequently remembered for his doubts. Maybe that is because we sympathize with him: at times we too have more questions than answers, more doubts than certainty. There is something refreshing in the courage of Thomas to give his doubts voice. We always have questions, even when we don’t want to admit it. There are things with which we struggle, things that confuse us, things that make us wonder. Yet God is with us through all of that – not condemning us, but continuing to love us. Many people struggle with the stories of the Resurrection. They may seem to stretch our understandings of how things work in the “real world.” But does it matter? In the variety of resurrection stories the gospels give us – both on Easter morning and beyond – we are given a range of ways in which people encountered the risen Christ. As Jesus indicates to Thomas, there are many ways to experience the risen Christ, and we must never let ourselves be limited. What are some ways you have experienced the risen Christ in daily living? What do we, as individuals or faith communities, need to see or touch or understand in order to believe? What might we need to show or do for others in order that they too might catch a glimpse of the risen Lord Jesus? 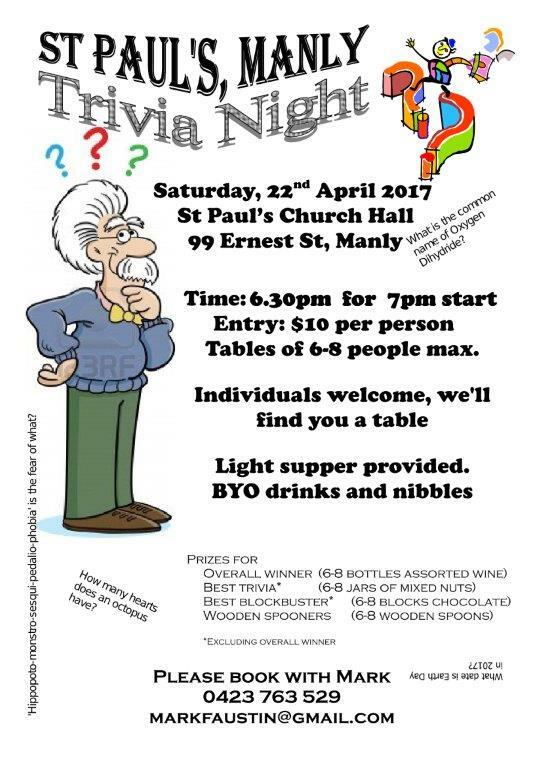 Come join us for a night of fun and mystery. One of the most famous sermons of the Middle Ages was given by an anonymous monk who announced he was going to preach on “Agape” or the “Love of God.” The sermon was to take place on Saturday evening, just before dusk. Instead of mounting the pulpit, however, the monk sat silently in his seat. The setting sun shone through the stained glass windows with eerie glow. When the cathedral was finally dark, he went to the altar and lit a candle. Then he walked over to a statue of Jesus on the cross. And in silence he held up the candle to the wounded hands. For several minutes he just lit the hands. Then he moved the candle down to the feet, and held the candle there for several minutes. Then he moved the candle up to the open side; and then finally to the crown of thorns. After doing this, he pronounced the benediction, and everyone left the cathedral in silence -maybe pondering the greatest sermon they would ever hear, a wordless worship of the one who loved us so much he would die on the cross for us. But how much more wondrous – He rises from the dead bringing us with Him! Dear friends, this week I was rereading the writings of a young woman (Glennon) who writes a ‘Blogg” called Momastery. She says it better than I could so I share her words with you. If it’s awful, it’s not over. Good Friday means that Life Hurts. Saturday means that if we wait and hope and keep vigil- Easter Sunday will come to prove that Love Wins. Friday, Saturday, Sunday. Pain, Waiting, Redemption. It’s the greatest story ever told and that is because we ALREADY KNOW IT. It’s the story of our lives, our days, our bodies, our relationships and every flower and tree. If it’s Friday for you- keep breathing. If it’s Saturday for you, keep waiting and watching. If it’s Easter for you- NOTICE AND REJOICE AND TELL ABOUT IT. Keep Easter tucked in your heart to pull back out and remember, when Friday comes again. DO NOT BE AFRAID when it’s Friday or Saturday. REMEMBER that Sunday always comes. Easter is always, always on its way. Though we remember with a combined retelling of the passion – the gospel set for today is actually Matthew 26:14—27: It would be good to contemplate Matthews version of events over the next few days. 66. Once again I found the following reflection, from “Seasons of the Spirit” (Mediacom) helpful as I have been preparing for the coming week. No matter how one slices it or observes it, this is a day of contradictions. Even if one only read the Palm Sunday narrative, it is so steeped in the context of what is to come that we can hardly celebrate it with unbridled joy. For most churches, the celebration of palms at the beginning of worship will give way to a sombre reading of and reflection on the passion of Jesus. Each year we read it in all its grimy and painful details, and read other scriptures that simply help give some historic context. It is a painful and difficult day. Matthew’s account of Jesus’ last days of earthly life include Jesus’ cry: “My God, my God, why…?” (27:46). These words, taken from Psalm 22, are more than Jesus’ cry from the cross. These are our words as we encounter Judas’s betrayal, the disciples’ desertion, and the women’s faithful vigil at the cross and the tomb in this reading. It seems that Matthew portrays Jesus’ twelve disciples in a harshly revealing light. Though Jesus asks them to keep watch with him in prayer (26:36), they fall asleep repeatedly. When Jesus is arrested, they flee into the night (26:56). These disciples are not at the cross, or the tomb as the women disciples keep vigil. Matthew treats the religious and civil authorities involved in these events in an equally frank manner. Some have judged Matthew and the other gospel writers to be anti–Semitic because of the language they use in the Passion narratives. In Matthew’s account, the problem is not the religious beliefs of the leaders involved – the problem is leaders who are driven by fear and rush to judgment. The difficulties arise because of the choices made by certain leaders. Pilate chooses to “go along to get along.” Undoubtedly, Matthew’s Jewish readers would have recognized a powerful symbolism in Pilate’s seemingly simple act of washing his hands. According to Deuteronomy 21:1–9, this could have been a way of declaring Jesus’ innocence, but Pilate – through his cowardice – reduces it to something meaningless. Matthew strives to show how Jesus’ words and life fulfill the Hebrew Scriptures. For example, the tearing of the temple curtain in 27:51 heralds the end of the old temple system and the saints rising from the tombs in 27:52–53 hearken back to Ezekiel’s dry bones. Matthew uses several titles for Jesus. “Son of Man” is the title that Jesus uses most often. Jesus is declared to be the “one who comes in the name of God” in the account of Jesus’ entry into Jerusalem in Matthew 21:1–11. The title “Son of God” is used in the High Priest’s questioning of Jesus (26:63–64). Jesus’ answer – which does not deny this identity – sparks the capital charge of blasphemy. “King” or “Messiah” (christos in Greek, meaning “anointed one”) takes precedence in the trial before Pilate (27:11), because a “king” represented a political threat to Roman authority. “Son of God” is the confession by the Roman guards and centurion (27:54). In spite of all that death can strip away, God’s people declare with the psalmist in Psalm 31:9–16 that “my times are in your hand.” The acclamation, “The Lord God helps me,” is spoken twice in Isaiah 50:4–9a, a statement of extraordinary trust when made in the midst of insults and physical abuse. Philippians 2:5–11 declares that Jesus’ death is not a loss of hope. Jesus chooses God’s way over all. Jesus’ life is lived in love and obedience to God. What does this mean to us? Even though over 2,000 years have passed since the events recounted on this day, for many the story is as real and as present as if it were being reported in real time. On the one hand, these are historic events, but on the other hand, in a very real way they are a description of the life we live each day. How is our world denying and rejecting Christ even today? How are we complicit in that? I was touched by a poem by Robert Browning Hamilton, as I pondered the readings for this Sunday. I was reminded that in our darkest moments Jesus not only walks with us, but also weeps! Perhaps at our happiest we do not feel the need for further companionship… but in those deep dark moments, when no one else can touch our hearts, Jesus weeps. We come to know him as we share the darkness and we know that we are not alone.